The last Thursday of the school term saw the culmination of our Asian Studies in HSIE. The celebrations started with a delicious lunch of Thai fried rice, chicken satay sticks, butter chicken, roti bread, spring rolls and sushi. For dessert the students were able to get an insight into their futures by choosing a sweet tasting fortune cookie. Then students were then able to share the knowledge they had gained about their Asian country in our special assembly. After presenting the information they had learnt about India Years 1 & 2 acted out a shadow puppet performance of the traditional Indian folktale ‘The Little Mice and the Big Elephants.’ They then entertained us by playing the Indian melody of ‘Baak bakum paira’. Years 3 & 4 presented their enthralling knowledge of Thailand. They translated some common words into Thai and taught us how to say these words. They then told the traditional Thai tale of ‘In and Na’. 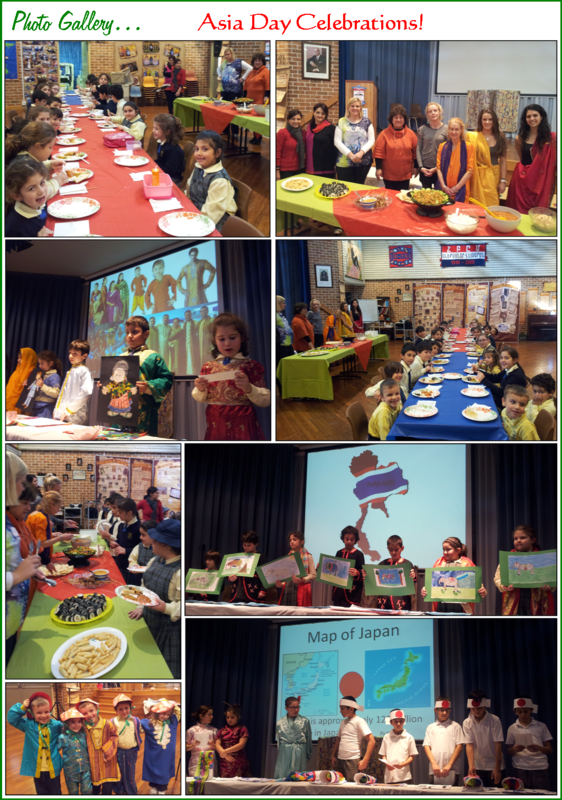 Years 5 & 6 presented their extensive knowledge of Japan. The school learnt how to count to ten in Japanese with the Year 5/6 guidance. The students were fascinated to see the 5/6 photographic chronicle of the making of sushi rolls. Lastly we were entertained by the Prep - 2, as they used the Indian hand movements of ‘hastas’ to represent animals in a dance performance. The children were able to dress in the appropriate costume of the country. All the students had a great educational experience learning about some of the unique customs and aspects of the daily life of the three Asian countries studied. Thank you to all the teachers for organising the event and helping prepare the food and dress the children.